Inspired by old silent films and pre-cinematic technology (zoetropes and magic lanterns) and their desire to work with pop up books, a British husband-and-wife teamworked for four months at The Kuenstlerdorf Schoeppingen in Germany for what would become the miniature theatre: The Icebook. At its embrionary stage, The Icebook's maquette was a tool to pitch their idea to producers as their goal –initially--was to make a full scale show on a stage with live actors. “We showed it to a few people and they were they really, really loved it and they thought it works really well as a miniature show,”dancer Kristin McGuire said in a phone interview from her studio in the U.K. Thanks to the magic of the Internet, the first invitation they've received was from the Theatre Paper Festival in Holland, where they premiered their 20-minute show in 2011. Since then, the McGuires have performed in 11 countries including the United Kingdom, Germany, Spain, Ireland, the United States and for first time they will be performing in Canada. "The Icebook" delves into themes such as the need of love, hope and loss in the heart of a fantasy, dream-like world. It narrates the story of a young man (Davy McGuire) lost in the forest, to him an unknown icy world, ruled by the Ice Queen (Kristin McGuire).The man, who aches to find love, goes after her. He finds the Ice Queen, takes her home and a death ensues when she tries to warm up by the fireplace. The story is a sum of the tales "The Snow Queen" penned by the prolific Danish author Hans Christian- Andersen and "The Snow Man" by British novelist Raymond Briggs. The Icebook is made of cut out paper and black and white video, projection and animation. Filmmaker Davy McGuire shot the video with a DSLR camera, which resulted in a pristine image. However, to make it look more "human" he “dirtied” the images in post production to achieve the desired old-film, film noir look. Their aesthetics evoke 20th century Russian fairytales, as well as the works of Jan Svankmajer, Flatworld, the Judder Man from the Metz advert, Georges Méliès and German expressionism. On the other hand, McGuire noted that the audiences' feedback is "always complimentary". As the show is a miniature, the space is limited and it only allows an audience of 10 to 12 people maximum. Despite its format, she emphasizes that the play is adult-oriented because of the aesthetics, and the sadness and tragedy embedded into the story line. "I think it's not colourful enough, not quick enough, not happy enough for children, you know?," McGuire explained. 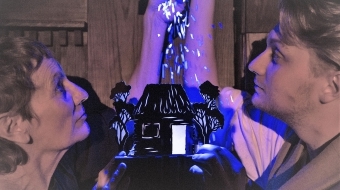 As for their desire to create a life size version of The Icebook -- they did later a similar work with the "Howl’s Moving Castle" , a life-sized cut out paper on the stage with live actors-- but McGuire affirmed they don’ t think of it anymore. “Maybe in a few years, “ she explains. Yes, [we are] extremely happy with this small one because it's just Davy and I and the book, and we can travel anywhere with it. It's just a very nice, intimate performance […]It's very practical!," McGuire said letting go a few laughs.